Joliet, 1940. You’re aboard one of the Chicago, Rock Island and Pacific Railroad’s premiere “Rocket Trains” – one of six crimson red and stainless steel “super luxury” streamliners connecting Chicago, to Minnesota, Colorado, New Mexico, Texas and Louisiana. The “Rocket” names came from the title of the railroad’s first steam locomotive, but these premiere trains were powered by the railroad’s newest streamlined diesel locomotives. 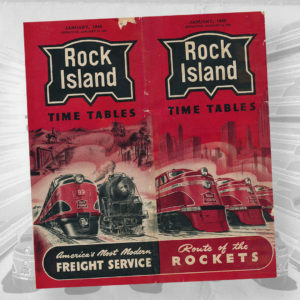 Debuted in 1937, The Rock Island Rockets offered passengers first class accommodations, sleeping and observation cars, cocktail and coffee bars, radios, an on board barber, valets, hostesses and connections to California. The Rockets arrived at LaSalle Street Station in downtown Chicago adjacent to the passenger trains of the Nickel Plate Road and New York Central and steps away from Chicago’s five other railroad stations. Competition from highways, airlines, and other railroads combined with a failed merger attempt stifled the Rock Island in the 1960s. By 1978, The Rockets were no more. By 1980, the Rocket Island Railroad was dissolved and its commuter train services absorbed by the newly formed Metra. Joliet, 2017. Passengers no longer board trains at Joliet Union Station, but the city is still an important hub for Amtrak passengers and Metra commuters. The route you’re riding on today is known as The Rock Island District and though much has changed in the last century, Chicago remains one of the busiest and important railroad centers in the country, hosting 1,300 trains a day. The rich heritage of the Rock Island line and the region can still be discovered on board today’s train. The rails we are riding on today were built by a predecessor of the Chicago, Rock Island, and Pacific Railroad, and first operated in 1852. The Rock Island Railroad played an important part in Chicago’s early development: it was the first railroad to reach the Mississippi River from Chicago, built a bridge across the Mississippi in 1856, and employed Abraham Lincoln as an attorney. The railroad built its famous passenger terminals on LaSalle Street in Chicago in 1903, and in Joliet in 1912. Steam engines were last used by the Rock Island in 1953 before being eliminated by diesel engines. At its peak, the Rock Island lines spanned from Chicago, to Minnesota, Colorado, New Mexico, Texas, and Louisiana. The Rock (as it was later known) operated extensive passenger services – local commuter trains between Chicago and Joliet, and long-distance trains that operated to Denver, Houston, and Kansas City, as well as the West Coast via a connection with the Southern Pacific Railroad. The long-distance trains were known as the Golden State, and the Rockets – the Rocky Mountain Rocket, The Twin Star Rocket, and the Corn Belt Rocket. The Rock Island operated its last long-distance trains to Peoria and Rock Island in 1978 – well past the 1971 creation of Amtrak, which ended most privately-operated long-distance trains. The Rock Island for the last half-century of its existence struggled to compete in markets overbuilt with railroads and rail capacity. After a series of bankruptcies and failed merger attempts, the railroad was shut down and liquidated in 1980. The Rock began to receive financial support for its commuter operations from the state of Illinois in 1976, and the state purchased the line from Chicago to Joliet from the bankrupt railroad in 1980. Operations were taken over by the state agency later known as Metra, who continues to operate the line today. Improvements made after 1980 included a new LaSalle Street Station in Chicago, one block south of the original station, rebuilt track, new equipment, and many new stations along the route. Limited freight operations are conducted along the route by the Iowa Interstate and CSX railroads. LASALLE STREET STATION – the towering 1903-built terminal was demolished in the early 1980s, but once housed the Rock Island, Nickel Plate and New York Central and all three railroads are represented in some way by today’s train! Last year’s Joliet Rocket trips were the first steam excursion to visit LaSalle Street since 1973. 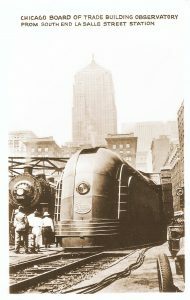 The New York Central “Mercury” at LaSalle Street Station. ENGLEWOOD STATION – Englewood was a meeting point for seven of Chicago’s major railroads and often marked the starting point of a race between the Pennsylvania Railroad’s Broadway Limited and the 20th Century Limited and still sees over 100 trains a day. In 2014, Metra built a mile-long flyover to eliminate delay of the railroad’s commuter trains. 16TH STREET JUNCTION – One of the oldest operating interlocking towers in the country, this 103-year-old structure originally guarded the intersection of four different railroad lines and is manned 24 hours a day, 7 days a week by Metra’s signal maintainers. Route information and history compiled by Chris Jacks, Kelly Lynch. Built by the Budd Company in 1952 for the Pennsylvania Railroad as a 60-seat coach, 14-seat lounge, and delivered for service on the Boston-Washington train The Senator. It later had the lounge area removed, and was used on the PRR’s Clocker service between New York and Philadelphia as No. 1596. It later was owned by Penn Central, and 1971 was acquired by Amtrak. It was later used on the New York-Montreal train The Adirondack, and was retired by Amtrak in 2003, when it was acquired by its current owner – Friends of the 261 of Minneapolis. Built in 1957 for the Union Pacific Railroad by American Car & Foundry as Postal Storage car No. 5741. Saw frequent use on Union Pacific’s famous “Cities” streamliners throughout the West. It was later converted to maintenance of way car 904267. Currently owned by Friends of the 261 of Minneapolis, who converted the car into a concession/bar car for use on excursions and charter trains. Built in 1949 by the Budd Company as a 21 roomette sleeper for the Pennsylvania Railroad. As roomette accommodations became unpopular with the public, these cars became surplus, and it was converted to a 64-seat coach with a 12-seat smoking section in 1963. The car passed to Penn Central, who sold it to the State of New Jersey in 1976, where it was used in commuter service. It was later sold to the Maryland Department of Transportation, who in 1994 converted it to a first-class car for use on trains between Washington, DC to Martinsburg, WV. The car was acquired by the C.P. Huntington Railroad Historical Society, Inc. in 2004, and it is based in Huntington, WV. Built as dome-coach #558 by the Budd Company in 1954 for the Chicago, Burlington, and Quincy Railroad for service on the Northern Pacific Railroad’s premier train, the Chicago-to-Seattle North Coast Limited, which the Northern Pacific operated in partnership with the CB&Q. It operated throughout the country in Amtrak service from 1971-1995 before being sold into private ownership. In the late 1990s, the car was converted from a dome-coach to a dome-sleeper, with the addition of three bedrooms, a galley, and a lounge seating area. The car was acquired by Paxrail in 2015 and it is based in Chicago. Silver Lariat was built by the Budd Company in 1948 for the Western Pacific Railroad for its train the California Zephyr, which operated between Chicago and Oakland, CA. After the California Zephyr was discontinued in 1970, and Amtrak took over passenger trains nationwide in 1971, they took possession of the car. It ran systemwide on Amtrak until 1985, when it was sold to private ownership. The new owner overhauled the car mechanically, and installed a bar/kitchen area under the dome. The car has run extensively from its base in Los Angeles in charter-train service since 1985. After The Joliet Rocket, the Silver Lariat will be sold to the Cuyahoga Valley Scenic Railroad. Silver Palace was built by the Budd Company in 1948 for the Western Pacific Railroad for its train the California Zephyr, which operated between Chicago and Oakland, CA. After the California Zephyr was discontinued in 1970, the car was sold to AutoTrain, who operated the car on trains from Lorton, VA to Sanford, FL. After AutoTrain service, the car ran in a variety of places, including on the Branson Scenic RR in Missouri, and the Algoma Central Railroad in Sault Ste. Marie, Canada. A full-length dome car, built for the Milwaukee Road by Pullman standard in 1952 for use on their Chicago-Seattle/Tacoma Hiawatha trains. After the west-coast Hiawatha trains were discontinued in 1961, the car was used in Chicago-Wisconsin trains, until sold to Canadian National in 1964 for use on their cross-country trains. When VIA Rail Canada took over CN’s long-distance trains, they took possession of the car in 1978. VIA sold the car to the Chicago and North Western in 1985 for their business trains. North Carolina DOT acquired the car in 1996 and performed extensive mechanical and other upgrade to the car. The car was acquired by its current owner – Friends of the 261 of Minneapolis – in 2005, who renovated the interior in 2010. Built in 1949 by the Pullman Company for the Pennsylvania Railroad as a 1 double bedroom, 1 compartment, 2 drawing room, buffet, lounge observation car and originally named the Frank Thomson. It was one of seven observation cars delivered to carry the marker on PRR’s famous name trains, such as the Spirit of St. Louis. Retired by the PRR in 1967 and sold into private ownership, it was extensively restored to its original configuration in the early 1990s, and renamed for the Native American baseball player Louis Sockalexis. It was sold to a new owner in 2018 and renamed back to Frank Thomson. It is currently owned by Keystone Pullman Rail Tours, LLC. LISTEN TO "THE ROCK ISLAND LINE"